Is your URL blocked on Facebook? So, you are not able to share your website stuff anywhere. 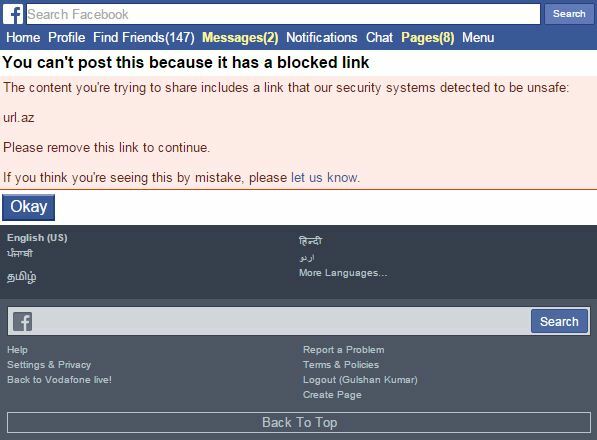 Don’t worry if Facebook is saying “Sorry, this post contains a blocked link.” Here’s a proven solution to get rid of this problem permanently. Disclaimer: This tutorial is strictly for the educational and informational purpose, sharing in good faith. I don’t encourage to misuse in any way, for any loss or damage the author shall not be held as responsible. You will learn here a unique technique to post any type of blocked link on Facebook. Also, you will be able to prevent your original URL from getting blocked on Facebook. As per as I am guessing if I’m not wrong. I think URL is being blocked by reporting by other users as spam. Let’s consider once your URL is blocked permanently. You tried changing your Dedicated IP address. But nothing happened from your hosting side. Finally, you think there is a problem with your domain. Yes! So, you can’t change your domain name. Thus, for sharing the link on Facebook, we can take help of reputed Google Blogspot platform. Yes, I’m not kidding! this is the requirement of this trick. So, you can easily bypass Facebook warning and captcha while sharing blocked link. As we all know that, we can use Subdomain of Blogspot too many times. Also, it is 100% free to create a blog on Blogspot. Using one Gmail account, you may create up to 100 blogs. Again, Facebook will never send you any warning. 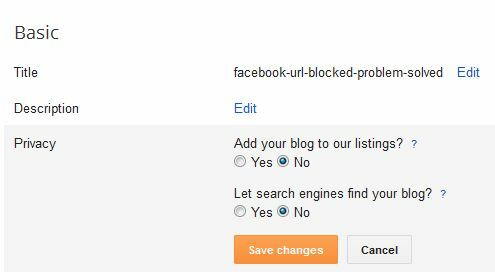 Just follow these simple steps to learn how you can quickly post a blocked URL. First of all, it is important to unblock your URL. Now replace all pre-existing HTML code of Google Blogspot with link unblocker code and click Save template button. Hey! Thanks for that, dude!